A heated indoor/outdoor pool an on-site restaurant and lounge and comfy accommodations are the draws at the Sheraton Eatontown Hotel. The six-floor Sheraton's 208 non-smoking rooms boast Sheraton Sweet Sleeper beds coffeemakers AM/FM clock radios flat-panel TVs and free Wi-Fi. There's a heated indoor/outdoor pool and a fitness center. The restaurant on-site serves meals and drinks and snacks can be enjoyed in the lounge. The Sheraton also provides a business center 24-hour front desk concierge desk guest laundromat and valet dry cleaning. Room service is available. Parking is on the house. 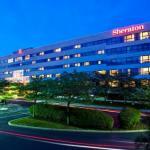 Located off Highway 35 the Sheraton is about two miles from the Garden State Parkway. Monmouth Park Race Track is four miles. It's less than a 20-minute drive to several public beaches such as Seven Presidents Oceanfront Park or Avon by the Sea. Fun destinations in the vicinity include Jenkinson's Aquarium 30 minutes away and Six Flags Great Adventure about 40 minutes from the hotel. Newark Liberty International Airport is a 41-mile drive.